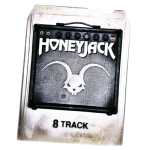 Share the post "Album review: HONEYJACK – 8 Track"
Honeyjack are a duo of Mark Summerlin (vocals/guitars) and T.J. Scarlett (guitars). Mark Summerlin has been the guitarist and musical director for Seal and he was planning this to be a solo album, that was until he hooked up with T.J. Scarlett and Honeyjack was born. This is an assured debut album that delves into southern rock, albeit the more AOR/melodic rock end of it similar to bands like .38 Special and Lynn Allen. Listening to the melodic rock of ‘Hated Being Right About You’ you’d think it was .38 Special. A really classy song and indeed all eight songs on here stand up to repeated plays, with a good mix of styles. The personal lyric on the ballad ‘Show You Arkansas’ takes the pace down a little and has the appeal to get daytime radio airplay if given a chance. ‘Know How To Pick ‘Em’ has a humorous lyric and a fast paced country picking style in the guitars, making for another stand out track. Speaking of guitars the playing throughout is top draw and includes some sublime slide guitar – listen to ‘Outcast’ for plenty of guitar solos. How did Honeyjack come about? I was working with TJ on some demos that I had originally intended to shop around, as a writer. After writing a couple songs together, we decided to keep going and finish out a complete album, as a new project. Then eventually, we got it going as a live band as well. Can you tell us some of the stories behind the songs that appear on the ’8 Track’ album? ‘Outcast’ was like our version of epic tunes we’d grown up with from old-school AOR bands. I’ve always been a fan of those tracks on rock albums that have multiple themes, (and multiple guitar solos! ), that really take you on a journey. I know that kind of thing isn’t for everyone, but our philosophy has been to keep it interesting to the two of us first, or we scrap it and move on. ‘Wired That Way’ is the most classic way a song co-write can come about in my opinion. I had some lyrics sitting around for a while that I couldn’t find the right music or melody for, and TJ had an awesome riff and instrumental he’d started some time ago. I remember hearing that for the first time, and knew that this could really work. Who are the band’s musical influences and if given the chance, who would Honeyjack like to tour with and why? Always a tough one, because we like so many artists ranging from throwback country (i.e. Waylon Jennings and Buck Owens) to 70’s hard rock and 80’s metal, (like Kiss or Extreme). So, for touring, that leaves a pretty wide-range of acts we think we could fit with. But we’d probably lean more towards the old-school rock acts because it’d be more fun! We recently got to open for Styx, and that seemed to be a decent fit. You’ve been Seal’s guitarist and musical director. How did you land that role and what have been the live highlights for you? While writing and playing in my own local projects for years, I was lucky enough to have a side job on the crew of several major touring acts. I did stuff like keyboard tech-ing and programming the playback tracks for pop artists. So, basically, it was “right place-right time” for me with Seal. He needed some help on guitar and background vocals one night, and I happened to be there. After that, we actually wrote a few songs together, which cemented that relationship a lot more. For live experiences, I’ll always remember getting to play the Forest National arena in Brussels. It’s known for having hosted many of the greatest rock bands, and most of them have signed all the walls backstage, so for me it was like a museum. Is there much of a live scene for Honeyjack to try and get shows? There used to be more of a local live-music scene in Northwest Arkansas, with lots of original bands and several high-energy music clubs that were competing for business. It’s more or less slowed down in that regard, but since the region has grown, we can get larger acts to play here. Where would you like Honeyjack to be this time next year? I’d like to see us having more music out there, which means getting back to finishing this new batch of demos soon! To anyone that’s listened to Honeyjack’s music, fan or not, Thank you! We’re excited about the new group of songs that are starting, can’t wait for you to hear ‘em. This entry was posted in ALBUM REVIEWS, ALBUM REVIEWS (Mobile), All Posts, INTERVIEWS, Interviews/Rising Stars and tagged .38 Special, 8 Track, album, AOR, Honeyjack, interview, Mark Summerlin, melodic, review, Rising Stars, rock, Seal, southern rock, TJ Scarlett. Bookmark the permalink.